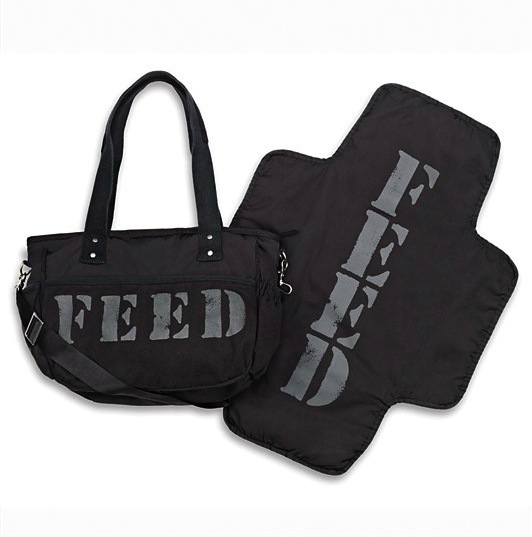 DKNY has a new collaboration capsule collection with FEED, the hunger preventing nonprofit led by social activist/designer/model Lauren Bush. The collection has three pieces: brilliant collapsible (read: easy to pack) rain boots, a city survival tote and umbrella, and a diaper bag. In the sweetest way, the diaper bag especially makes me smile, with the large ‘FEED’ on one side, I envision a mommy or daddy does a lot of feeding when toting this chic bag about town. So, what makes this fashion “good”? Each diaper bag purchase will provide 1 mother and 1 child with a year’s supply of mirconutrient powder through the United Nations World Food Programme. This entry was posted in Accessories, Her Closet, Her Inspiration and tagged dkny, dkny feed, fashion for good, feed diaper bag, feed lauren bush, feed rain boots. Bookmark the permalink.